The Zafferano Collina d’Oro plantation embraces over two hectares of soil and is framed in the picturesque scenery of the so called “Collina d’Oro” (“Golden Hill”), based in Faloppio (Como), not far from the lake shores. Our productive chain takes place in full respect of environment and nature and runs in tune with our eco-friendly philosophy. That’s why we have decided not to use potentially spoiling chemical additives or machineries in any phase of our productive cycle. 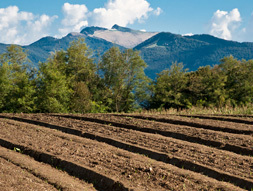 The cultivation of Zafferano Collina d’Oro starts with an indepth ploughing and with the landfill with manure. The consecutive phase dedicated to perfect and level the soil surface is usually followed by the setting of the flowerbeds which will host our carefully selected top quality bulbs. At a later stage, between the month of August and early September, we plant our bulbs in flowerbeds. For each hectare of soil, we usually ditch on average between 500 and 600 thousand bulbs, which don‘t require irrigation. 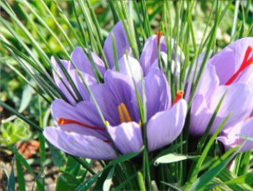 Saffron life-cycle begins with the early September rains and with the birth of a tuft of filaments. But the real magic is given by flowers, which make our saffron fields look really stunning. Made of six rose-lilly colored petals and of a scarlet thread in tree filaments with a trumpet shaped apex, the flowers of Zafferano Collina d’Oro dot our fields when in blossom, enchanting our visitors at first sight. At the beginning of October, we collect flowers early in the morning, before the sun opens them, and complete our harvest in approximately 20 working days, with no machineries or other tools, but only leveraging our hand activities. Our harvest process requires a careful manual work and a gentle touch. 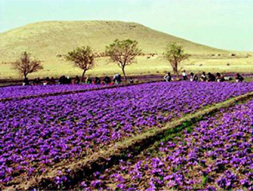 Perhaps only few people know that one chilo of saffron results from the cultivation of approximately 150.000 flowers and at least 500 hours of work. On the other hand, the birth of the new bulb usually occurs in March. Once we have conveniently moved flowers to the places where they will be transformed, we enter the fading phase and therefore we open them to pull threads out and set them in desiccation ovens. This is the climax of our all our work: in this phase threads lose more than a half of their weight. Soon after the desiccation phase, we go on with the thread selection which will be filled in and sold in our glass pots, the ideal material to preserve at the best their organoleptic features, their aroma and quality. You can buy Zafferano Collina d’Oro either on-line, using our e-Commerce platform, or visiting our exclusive gourmet shops. The cultivation of Zafferano Collina d’Oro, which embraces over two hectares of soil in the Faloppio municipality (Como area), in the so called “Collina D’Oro”, not far from the Como lake shores, is conducted in full compliance with nature and therefore, we do not use any fertiliser or chemical additive. To make sure that our product can offer top quality organoleptic and qualitative features, we have carefully selected our bulbs in the Italian regions standing out in the production of this precious spice and in the Spanish region of Castilla La Mancha, the Iberian diamond point for saffron cultivation. But what are the features that make our red gold so special? Zafferano Collina d’Oro stands out among alike products for its intense aroma, for its shiny orange-brown colours and for its incredible versatility of use in recipes, which turn it into the killer ingredient of exclusive menus. Ideal for the preparation of risotti and exquisite first dishes, our saffron awards a touch of personality to second dishes of meat and fish as well, giving an original taste also to the most appreciated desserts. Our saffron is available in threads to grant our product quality and sold in glass jars with exclusive design to preserve at the best its organoleptic characteristics. Our packaging process is conducted in compliace with European laws. On our labels we report the expiration date of the product, the name, the trade name and the address of our company. And more: Zafferano Collina d’Oro grants the comprehensive traceability of ist product by specifying on each pack the number of its productive batch. 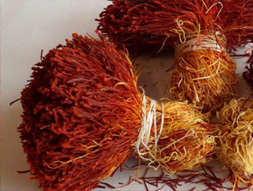 Features: saffron in threads with intense perfume, coloured with orange-brown nuances, often drifting to dark brown shades. Conservation tips: keep the product in a cool and dry place. Hot temperature and light can damage its original aroma. 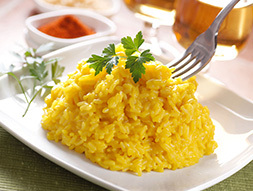 Usage tips: prior to using Zafferano Collina d’Oro, leave it to soak in warm water for at least 8/10 hours. Where you can buy it: Zafferano Collina d’Oro will be available for purchase either online, using our e-Commerce platform, or in our exclusive shops.